The final entry deadline for The 2014 (12th Annual) American Business Awards, the premier business awards program in the U.S.A., is this Wednesday, April 23. 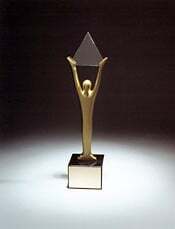 Complete details on the ABAs are available at www.StevieAwards.com/ABA. Maybe you haven't entered yet, and you're swamped this week, or you're not sure of the benefits of participating, or haven't yet made the case to your boss or your colleagues about why you should make the investment in time and money to submit nominations to the ABAs. Here are 10 great reasons why your organization should enter The American Business Awards. 1. Entering the ABAs is a cost-effective way to thank and honor your valued employees and to build or burnish your brand. 3. Small companies have just as much chance to win a Stevie as big companies do. Every year, household-name companies such as Apple, Delta Faucet, and Ford Motor Company are joined in the winners' circle by small and medium-size organizations that are still building their brands. 4. There are scores of categories covering every aspect of business, from management and finance, to marketing and public relations, to product development, customer service, and human resources. 5. If you’re a marketing consultancy or media production company, your work will be reviewed and honored by potential clients, not just your competitors, and there are many categories for web sites and apps, marketing campaigns, video productions, and other media. 6. Many of the world's top business leaders will review your nominations during the judging process. 7. If you win a Gold Stevie Award you’ll get to make a 30-second acceptance speech…before an audience of hundreds of executives from across the country…during a nationally-broadcast awards dinner…that will also be streamed worldwide over the Internet. 9. We'll promote your win across our web site and media. We get more than 70,000 visitors to our site every month, have more than 24,000 weekly email newsletter subscribers, and many thousands of Facebook, LinkedIn, and Twitter followers. Need more reasons? Need help choosing categories? Contact us. We won't officially extend the entry deadline, but if you need a few extra days to submit your entries you may have them, but you must request a brief extension in writing.